Have YOU ever wanted to be the wizard of Falador Park? Well now you can, with invention! The main purpose of invention is to augment your weapons, armor, and other gear with pieces of technology you have created. Invention also allows you to make new items that are useful in certain circumstances. Invention is an artisan skill (a skill involved in the production of materials). It is different from other artisan skills such as smithing and crafting in that the items you are creating are invented by you, i.e. they did not exist in the world of RuneScape before you created them (unlike, say, an iron platebody). Invention is an elite skill, requiring level 80 in smithing, crafting, and divination to begin. 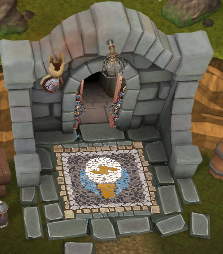 To begin the skill, enter the invention guild near the dwarven mines entrance north of Falador. Then, talk to Doc. Doc will take you on a tutorial which will give you a run down on the basics of invention. It's good to read the dialogue so you at least have some clue on what to do (the author of this guide didn't do this and he regretted it; don't be him). The tutorial will also get you to level 4 invention. From here you will be able to begin the invention skill. The Invention XP curve is not like that of other skills. In general, low levels take longer to level and high levels are quicker to level. Level 99 is 36,073,511 and 120 is 80,618,654. Level 84 is halfway to level 99. To manufacture invention items, you're going to need materials that are stored in your invention pouch , which can be seen below your inventory in the EOC interface. 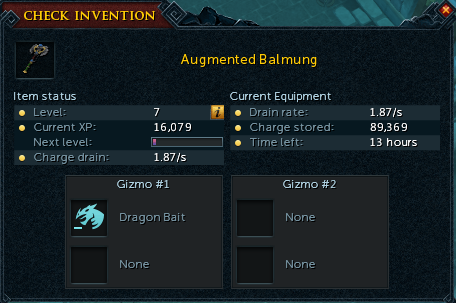 To view the materials you have, you can click on the invention pouch. These materials are gained by disassembling common items in RuneScape, mainly weapons and armor but also jewelry, summoning pouches, potions, food, etc. There are two ways to disassemble items. First, you can click on the disassemble option in the skilling section of the spellbook and then click on the item in your inventory you wish to disassemble. The second way is to simply drag the item you wish to disassemble from your inventory to the invention pouch. To find out what an item can give you upon disassembly, you can use the analyze button on the skilling section of the spellbook. As you can guess, not all items give the same invention materials when disassembled. Low level materials such as logs and bronze arrows will mostly give junk, the worst type of material you can get from disassembly. High level materials such as Torva Armour and Drygore Weaponry will get you useful materials and also rare materials that can be used to make cool gizmos. Of course nobody is going to be regularly disassembling these very expensive items, so you're probably going to want to disassemble mid tier items such as rune weapons and summoning pouches for most of your training. Here are materials listed as common. Here are materials listed as uncommon. Particularly important materials are listed in bold and given suggested item disassembly. These are materials listed as rare. Rare materials can be obtained at any level but must be researched before they are used, which requires a certain invention level. The workbench is where you both come up with ideas and create things from your ideas. There is a workbench in the Invention Guild near the Dwarven Mines. There are also workbenches in Varrock by the western anvils, Ardougne, the Seers Village Elemental Workshop, Yanille, and Falador. Workbench discovery is where you create blueprints for inventions. Discovery is fueled by inspiration, an intangible value that is attached to your character. Inspiration is gained through training or leveling. You get some inspiration from getting an invention level and you can get some more from training skills (including invention). To begin discovery, click on the discovery workbench option on the invention workbench and you will see a discovery interface. You should see a bunch of possible inventions you can create blueprints for on the left. Click on the blueprint you wish to create and then click on the modules. Once you have the five modules selected, click on the prototype button. Your prototype will probably fail; this is normal. What modules are needed is discovered through trial and error. Eventually you will find out the modules needed for creation. When you have figured out what five modules you need for that item, you need to place them in an order. Every order works, but some orders use less inspiration. For example, this is a configuration for a 200 inspiration object. This is a bad order. On the other hand, this order is pretty good. To save your inspiration, it is suggested you aim for perfect configurations (especially at higher levels). If you can't find an perfect configuration, you can probably settle for a excellent configuration occasionally, though it is still suggested you go for perfect most of the time. An excellent configuration is only a swap away from a perfect one. You may not have enough inspiration to create every item possible. Try to do the important inventions such as augmented gear advancement before inventing other miscellaneous objects that may have limited uses in terms of leveling invention. Most blueprints are unlocked by leveling, but some are unlocked via other means. For instance, two blueprints are unlocked after Nomad's Elegy and four blueprints can be found by playing in the GWD2 Dungeon. You will gain a small amount of invention experience for discoveries. Along with researching new invention gear to use, you can also research general improvements in your invention, such as the ability to train your invented weapon to a higher level. Here is a list of available research that can be done to improve your invention gear and training. Manufacturing is where you can produce inventions that you have discovered through the workbench. It is fairly straightforward. The interface for creating these invented items is similar to that of smithing and crafting. The main difference is that there is a large variety of items needed to create items. Materials from the invention pouch are needed as well. Here is a list of items that can be manufactured at the Invention workbench. For information on the race tech trees (Goblin and Dwarf) see the later tech tree section. Gizmos are used to add perks to your weapons, armour, or tools. These perks can be good (such as protecting an extra item with the protect item prayer) and bad (such as dealing 30% less damage to demons). Gizmo shells are created through the workbench and to get the perks, materials must be added to the gizmo shell. To do this, click on the gizmo shell and you will see an interface where you can add materials to the shells. Adding materials will give possible perk options, which you can learn more about by hovering your mouse over them. For common materials, five materials are required for each slot. For uncommon and rare materials, only one material is required for each slot. Generally, better materials give you better perks. If you see that none of your perk options are positive, there's no reason to create this perk (unless you want to expensively train invention through perk creation OR the game isn't hard enough for you and you want a negative perk). What perk you get upon gizmo creation is random, but it will be one or two of the listed possible options. 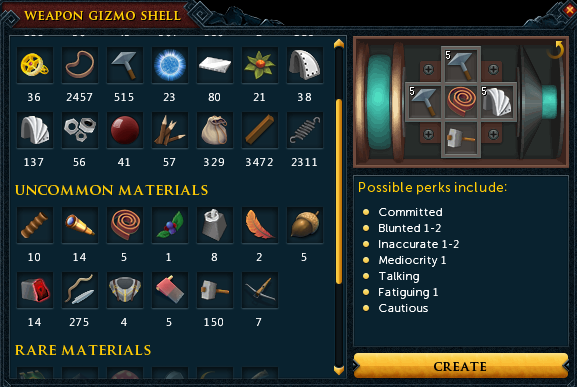 As stated earlier, perks are obtained by adding materials to gizmo shells. There are different perks for weapons, armour, and tools.The available weapon perks are listed below. In addition to the perks listed above, armour will also be able to have these perks. And these are perks that can be attached to tools. Some other perks that do not necessarily deal with combat, such as Talking or Committed also can be attached to tools by using materials listed in prior tables. Not all gear can be augmented. At the present moment, only weapons, legs, bodies, pickaxes, hatchets, and fishing rods of level 70 tier or higher can be augmented. There are some exceptions with easily obtainable weapons and gear, such as Blisterwood weapons. To augment a weapon, you'll first need to create an augmentor. These are fairly cheap creations that require a divine energy (225 incandescent energy and more for lower tier energy), 45 bladed parts, 45 tensile parts, 45 flexible parts, 8 enhancing components, and 7 powerful components. Once you have the augmentor, you can add this to a desired weapon or armor. Now you have the augmented gear, you can add perks by using the gizmo with the desired perks to the augmented weapon. Perks do not stack, i.e. adding the two same perks that increase weapon damage by 2% does not increase your weapon damage by 4%. In invention, individual items can be leveled through usage. Weapons and armor are leveled through combat. Like combat, not all monsters give the same weapon XP. Monsters that are higher in level tend to give more experience. Similarly with tools, high level resource gathering will garner more XP per resource. You can check your weapon, armour, or tool XP by right clicking your augmented gear. At 40,120 weapon experience, the gear will become level 10 (the level best for disassembly). At twice this experience value, the weapon will become level 12 (the level best for siphoning). Gear does not need perks to be leveled. Leveling gear will consume something called energy. This energy is stored on a charge pack in your toolbelt and can be checked by clicking on the toolbelt, clicking the invention icon and then hovering your mouse over the charge pack. In order to continue to level weapons, you will need to replenish energy. To do this, you will first need to create a divine charges. Divine charges require level 4 invention (meaning they can be made after the tutorial), 20 simple parts, and 225 incandescent energy. Each divine charge will give you 3000 gear energy. This part of invention is fairly expensive as the divine energy and the simple parts will cost you a fair bit. If you run out of divine energy your gear will stop leveling and also be as useful as a basic tier 1 weapon. At level 40 invention, you can uncover the tech tree for a certain race. There are currently two races you can research from: cave goblins and dwarves. To unlock the cave goblin tech tree, speak to Oldak in northwest Dorgesh-Kaan. To unlock the dwarf tech tree, speak to Drorkar in the Keldagrim Dwarf Palace. Each race's tech tree has additional materials and inventions you can research and create. To unlock these, you'll need to complete a set of tasks designated by a task board in the Invention Guild or nearby the Tech Tree experts. Generally the tasks involve handing in invention items, which you can do at the noticeboard. These tasks will give you points which you can use to buy new invention ideas. Your first chosen Tech Tree will give you 100% points for each completed task and the second chosen Tech Tree will give you 50% points for each completed task. Considering the high expense of creating gizmos, most people will be leveling invention through using and leveling augmented gear. To do this, use an augmented gear in combat or resource gathering. It will increase in level over time until you reach a maximum level (5, 10, or 15). 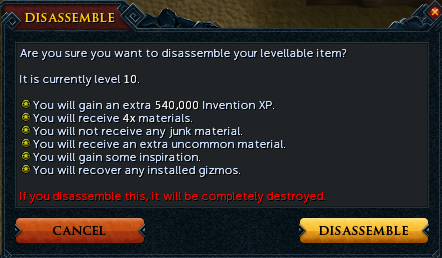 Once you have your gear at your desired level, you can gain a hefty sum of invention experience from either disassembling the gear or siphoning it (requirement of 16 invention), which will allow you to keep your original gear but only give you the experience of an item two levels lower you would get upon disassembly. Due to the level 16 requirement of siphoning, you will be training at first by disassembling your augmented gear. As your gear will be destroyed in the disassembly, it is strongly suggested you do not augment any gear you do not want to lose. If you do, you won't be able to use this leveled gear to train invention until level 16. If you are siphoning, it is best to siphon at level 12. If you are disassembling, it is best to disassemble at level 10. Not all gear gives the same experience upon disassembly or siphoning. Level 70 gear gives 10% less experience than level 80 and level 90 gear gives 10% more experience than level 80. At level 10, level 70 gear can be disassembled for 459,000 XP, level 75 gear for 499,500 XP, level 80 gear for 540,000 XP, level 85 gear for 580,500 XP, level 90 gear for 621,000 XP. Relatively cheap weapons level 70 weapons that can be augmented include the Balmung (300,000 GP replacement), the Handcannon, the Black Salamander (free replacement with 71 Hunter), and enhanced Excalibur. The only cheap level 80 weapon that can be augmented is the royal crossbow. However, another weapon worth noting is the Sunspear after the quest River of Blood. Requiring only 600,000 coins to reclaim from Ivan in Paterdomus, it is a level 78 weapon that can be used for melee, ranged or magic. Disassembly at level 10 rewards 523,800 XP. A common strategy beyond level 16 is to use a high level augmented weapon that you siphon at level 12 and then two lower level armor pieces (such as ganodermic or barrows) that you disassemble at level 10. This is fairly expensive. Cheaper alternatives include only leveling a two handed weapon or an offhand weapon. As with every skill in RuneScape, Invention comes with skillcapes purchasable at levels 99 and 120. Both can be purchased from Doc in the Invention Guild northeast of the Falador lodestone. In short, Invention involves coming up with blueprint ideas, manufacturing items from these blueprints, and then using the invented items in RuneScape.